Dental Calculus prior to cleaning- this is active infection in your pet's mouth. Nearly all pets suffer from some degree of dental disease by the age of 3 years and very few pets receive the daily brushing needed to prevent bone loss, abscess, pain and infection. We will assess your pet's oral cavity at every visit and make note of disease that may be present as well as offer you the safest and most-cost-effective options for treatment. Routine dental cleaning and evaluation is safe and effective for eliminating plaque, bad breath and oral infections in your pets. 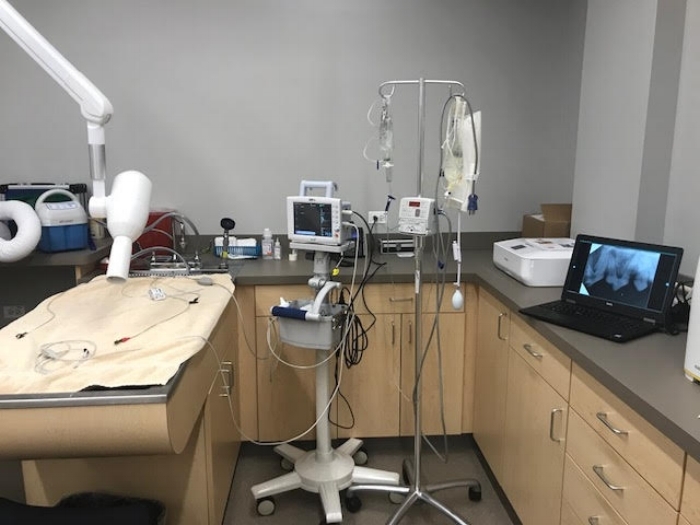 A thorough cleaning, including the space under the gum line (where your popcorn kernels get stuck and their bacterial infections begin) and complete dental X-rays will be performed by our Certified Veterinary Technicians. This allows Dr. Torok to fully evaluate all of the tooth surfaces for fractures, infection, abscesses at the root tips and even identify pre-cancerous lesions in the bones. This is the same pet's mouth following removal of all plaque and infection; even under the gum line. Every aspect of your pet's anesthesia and dental evaluation is done according to stringent AAHA (American Animal Hospital Association) guidelines, ensuring the utmost care and safety for your loved ones. Our dental suite offers the same monitoring as pediatric human patients undergoing anesthesia. This ensures he best possible outcomes for every patient.